Lately I have been blogging a lot about our overseas adventures. I still have more to say on that subject, but I just can’t ignore the beauty that I am privileged to have within an hour or two in practically any direction. I can drive towards Yellowstone National Park or Grand Teton National Park and be there in less than two hours. People travel from all over the world to visit these lovely parks. And I am lucky enough to have them both a stone’s throw from my house (assuming that the stone is tiny and can travel very far if thrown by a super hero, of course). Every year we buy a parks pass and try to make treks into both parks several times a year. We have had innumerable adventures, seen lots of animals, hiked or biked many trails, and even canoed. In high summer both parks are pretty packed, but mid-week is still a manageable time to visit. The best time to visit, though, is late August after school has started most places and into the Fall. The animals are out like crazy, the parks are less busy, and most days the weather is cooler but still nice. There is something about the Autumn sun and the direction of the light that makes the colors more vibrant. I just love it. Jackson, WY is one such fabulous place to visit. The drive is fabulous (as long as it is not in the winter) and the town has such a fun personality. 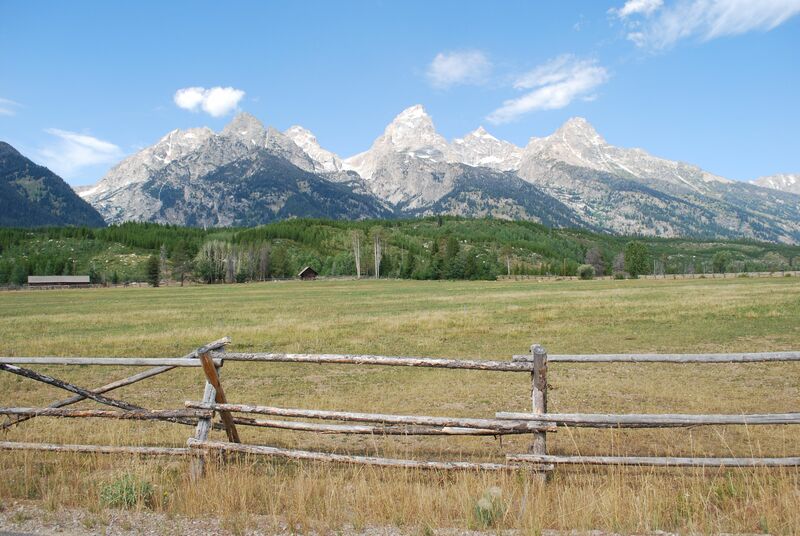 Plus, just outside of Jackson you get access to both Grand Teton National Park and Yellowstone Park. Yesterday we had a superb day in this neck of the woods. We began our day with bike ride. Grand Teton has some wonderful paved trails that they are adding to all the time. If you are coming from Jackson, WY, head to the Moose entrance of Grand Teton National Park. Before getting to the Moose entrance, there is a little place called Dornan’s. At Dornon’s you can rent canoes, bikes, and other outdoor equipment. 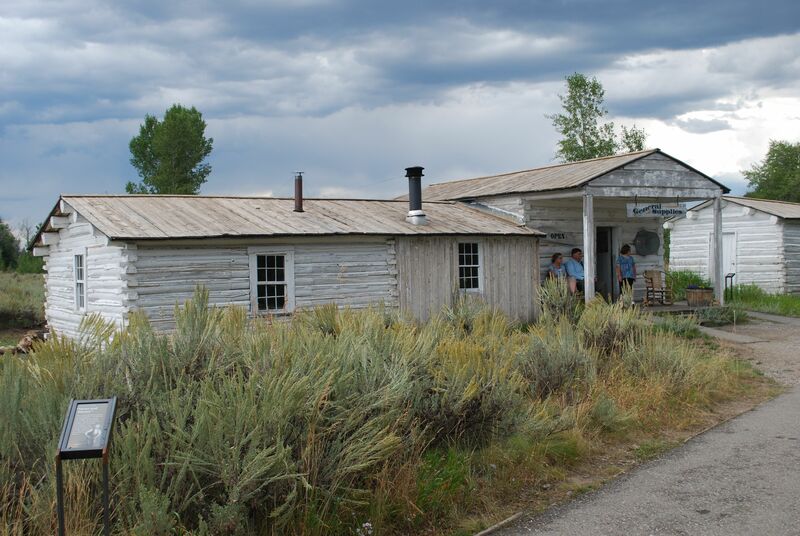 There are also several stores and a chuck wagon style restaurant. It is all very small. 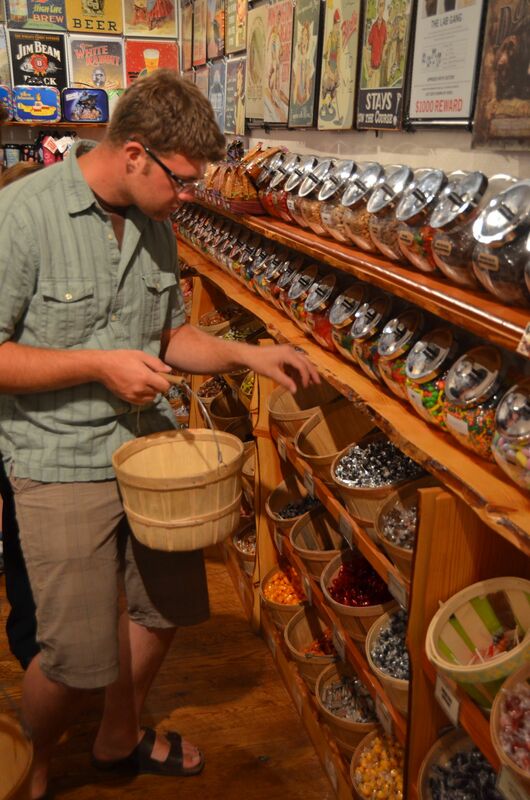 The bonus here is the general store that is stocked with all sorts of gourmet items. 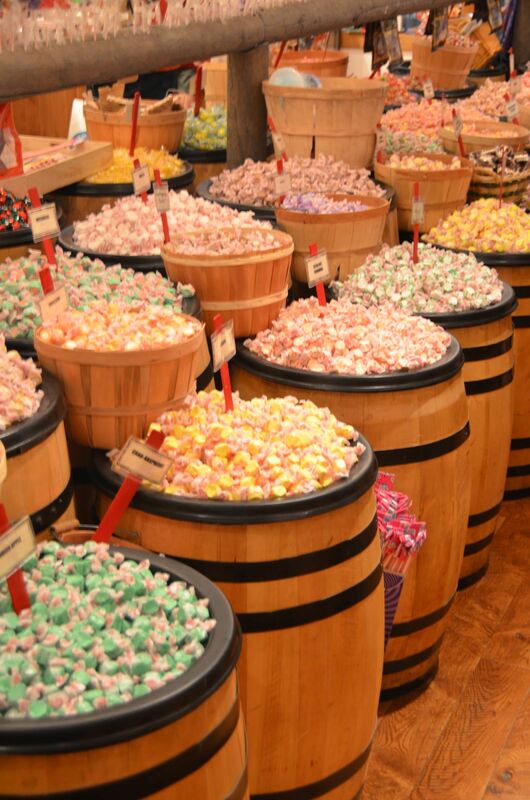 Over by the meat counter is a wall of candies in glass jars, and they are some of the best candies I have ever had, like cheesecake caramels, peppermint shortbreads, and chipotle smoked dark chocolate covered almonds. They also make a variety of cookies and brownies. Many people park at Dornan’s and ride their bikes from there. There is an entrance for bike riders into the park. When you start here, you begin your bike ride with a gargantuan hill that requires you to be in granny gear for at least half the way up and is quite a challenge. We have tackled this hill before, but some members of my family end of pushing their bikes up the last bit. This time, however, we decided to avoid the hill. If you have small children or are pulling trailers like we often are, you might want to avoid this too. To start after the hill, go ahead and enter the park in your car. About 1-1 1/2 miles in, there is a turnoff on the right hand side, called the Windy Point turnoff. It is nothing more than a small parking lot. If you park here, you begin at the top of the hill. 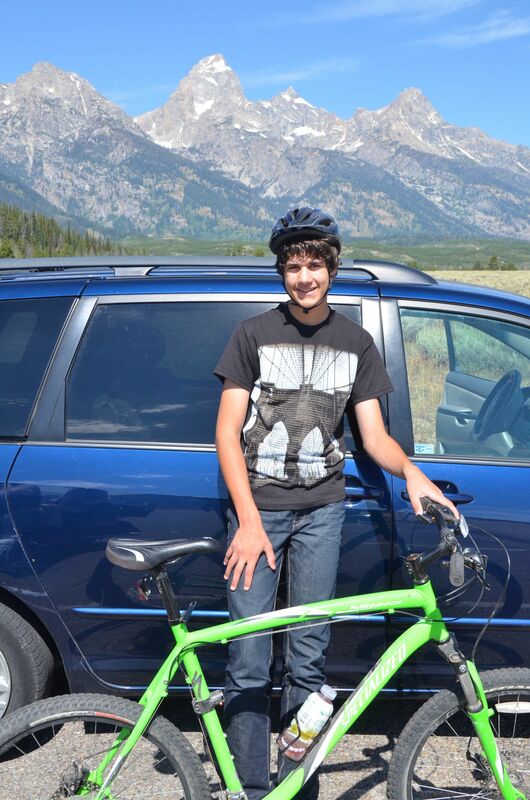 Goal: to bike to Jenny Lake. Then come back! From Dornan’s it is 8 miles there, from Windy Point it is about 6 1/2 miles, resulting in a 16 mile or 13 mile ride, depending on where you start. You know you arrive at Jenny Lake because the path ends with a large bicycle parking area. Here are bathrooms, places to refill your drinks, a visitor’s center, and shops. If you proceed to the lake you can rent canoes and kayaks. This is also where several trailheads begin and where you can take a ferry across the lake to various hikes like Inspiration Point. This is where we waded, enjoyed the view, and had some trail mix. While we were there, it began to get windy and cloud up. At 6,000+ feet, the temperatures can drop quickly and even completely clear skies can be filled with thunderheads in a matter of minutes. When biking, it is a good idea to bring some jackets to wear and bags to cover your bike seats. We have been forced to wait out surprise thundershowers before. Luckily, although we saw lots of lightening and heard thunder, we were able to avoid the rainstorm. Now, although you might want to avoid going up the hill, the same hill is grand fun to go down on the way back. We sent one member of our party to take the car down and the rest of us biked down the hill to a “don’t miss” area of the park, Menor’s Ferry. 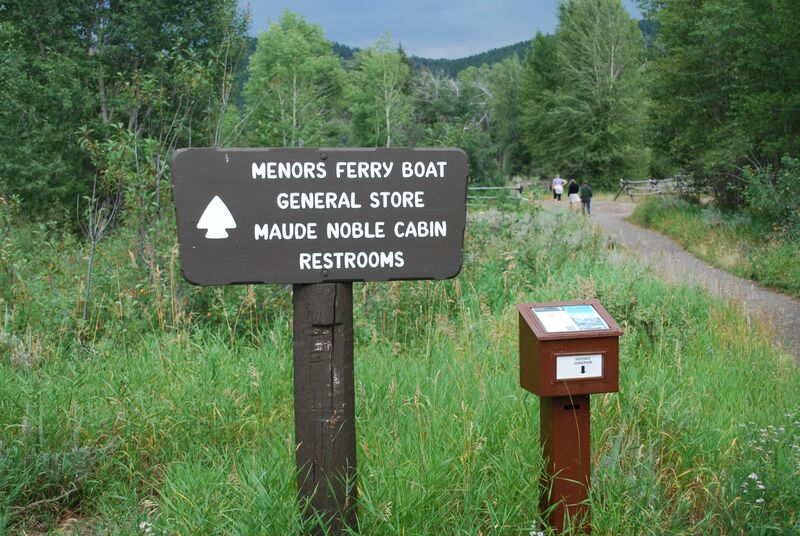 Menor’s Ferry is the first right hand turnoff after the Moose Entrance to the park, and it is home to one of the most charming stores in Wyoming. We like to get either Huckleberry or Sarsaparilla sodas and sit on the front porch to enjoy the atmosphere. We nearly always make a stop here when visiting the park. By now we were really hungry so we stopped for a picnic of Italian Sandwiches on homemade bread, then we headed over to the Jackson Country Aquatic Center. This is a fabulous place to cool off and relax. Their water slide is very fun, and if you go off season, not very crowded at all. Reasonably priced, as well. After swimming we spruced up and drove into downtown Jackson to visit some of our favorite shops. 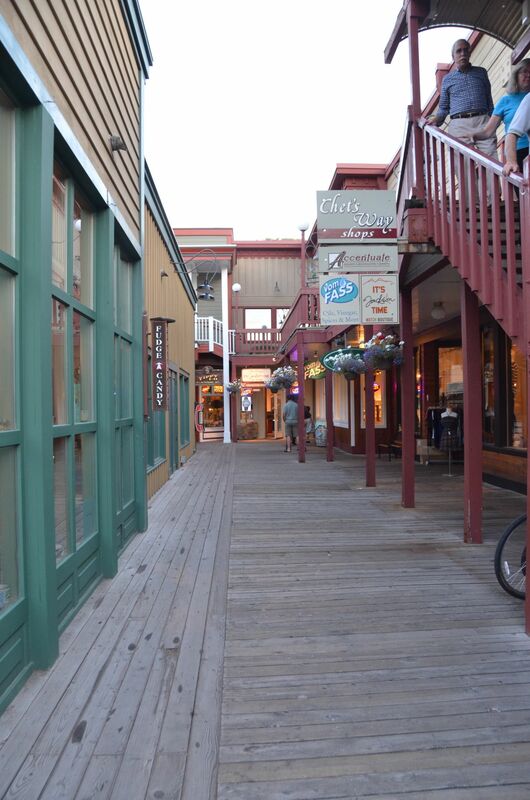 We like to wander around and check out all the designer western wear, art galleries, and fur shops. 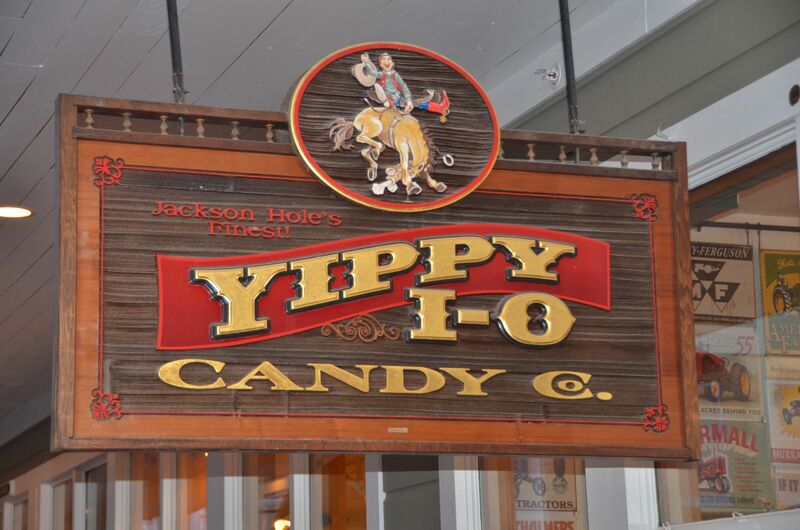 One place we always stop that is a favorite of the kids is the Yippy-I-O candy store. It is like a dream come true for them. Right next to the candy store is a newer store that I enjoy visiting. 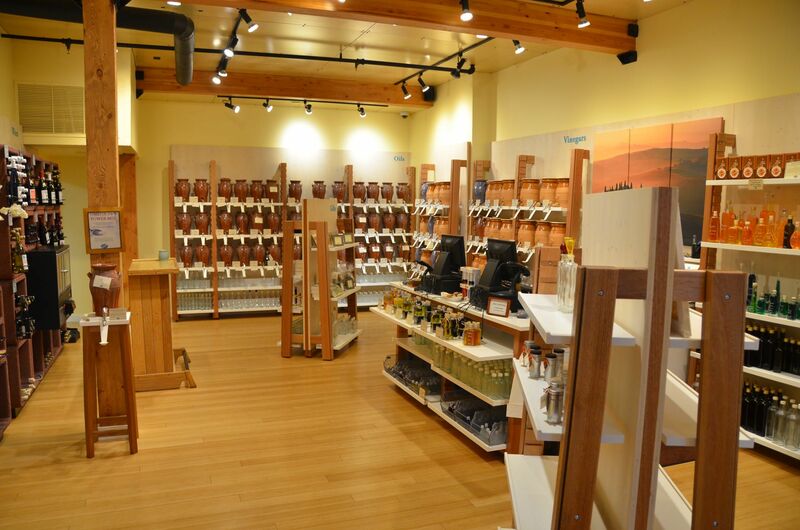 This store is called Vom Fass and is full of oils, vinegars, spices, and spirits. They have shelves of empty bottles for purchase that you can then fill from barrels. They will let you try anything you like out of tiny ceramic spoons. The prices were surprisingly reasonable, ranging from $3.99 to about $24.99 per 100 ml, depending on the oil or vinegar. I came away with some basil oil and citrus vinegar, which I will use to dress garden greens. Another Jackson ritual is lounging at antler park. But we were too tired and hungry so we went on to dinner at Bubba’s, a favorite low-key BBQ restaurant. 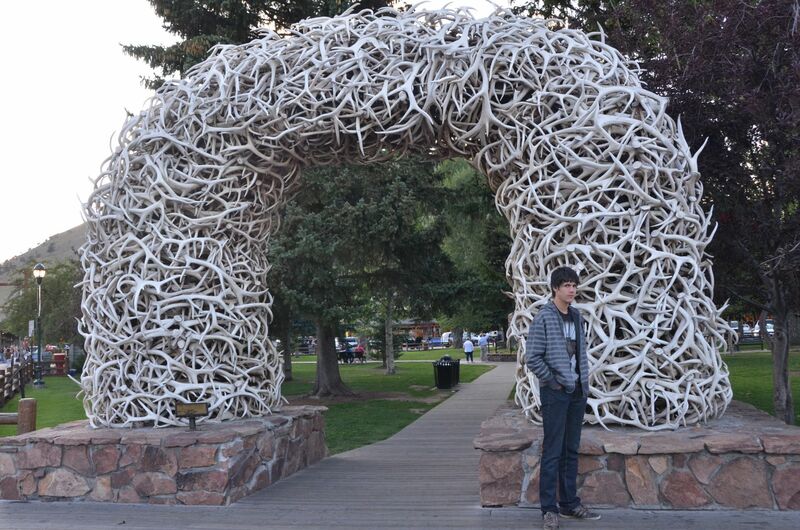 Shouldn't Joe be sporting Western Wear to be posing by an arch made of antlers? Yes, they are real. 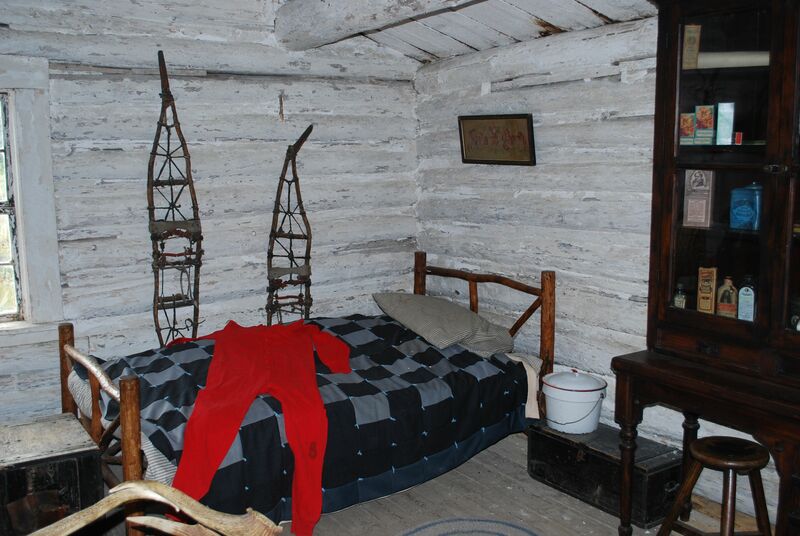 There is so much to do in Jackson that it really is an excellent travel spot for families. 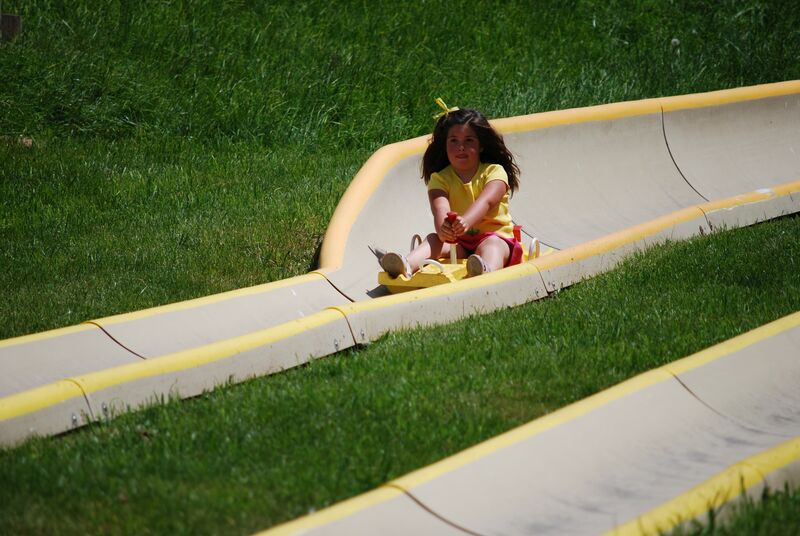 In addition to all the outdoor activities like hiking, canoeing, and biking, there is also an Alpine slide and most of the ski resorts keep the lifts running all summer. 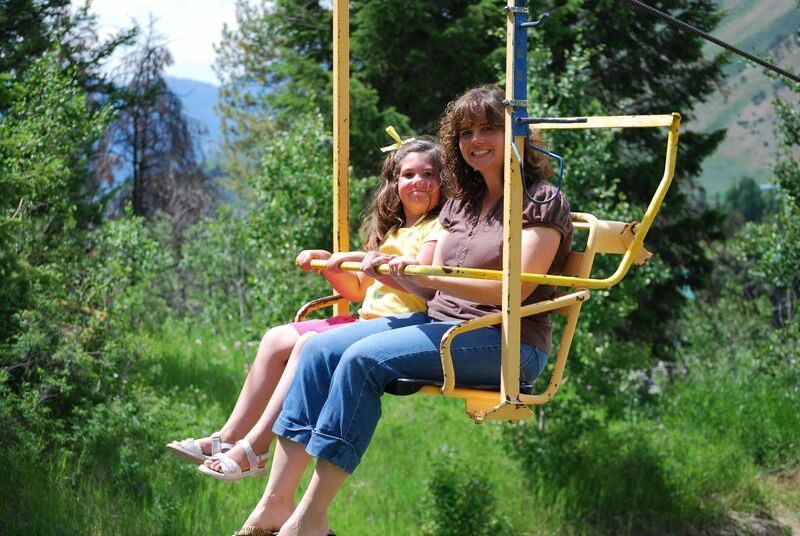 I think riding the ski lifts is just about one of the most relaxing and beautiful experiences. The breeze wafts gently past you, it is quiet, and the surroundings are exquisite. 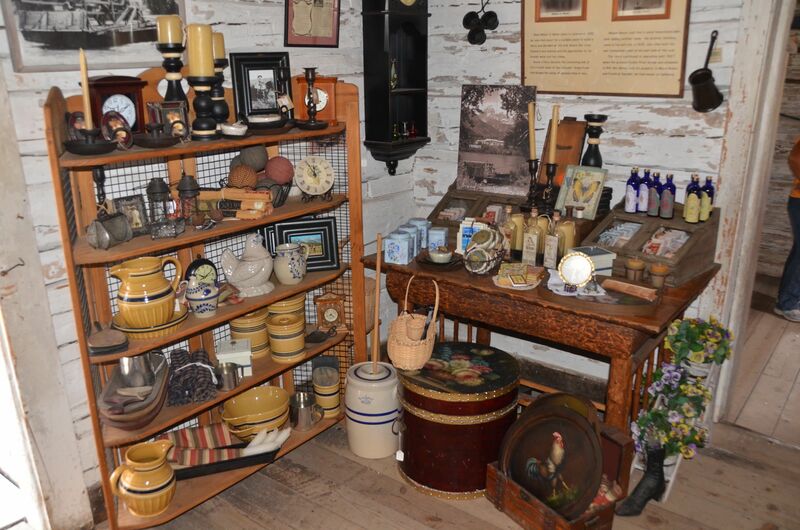 You could go to Jackson and easily keep yourself busy for a week or more. We know, because several summers we did stay in town for an entire week. There are many things you can do with your family, but there are also many fine restaurants and evening activities for the grown ups. The Grand Teton Music Festival is one of the best summer festival orchestra series in the world. Musicians come from all over the country to play for the summer. We have attended many concerts at the Festival and have been privileged to be festival guests several summers as my husband sometimes plays with them. No discussion would be complete without at least a mention of the Bar J Ranglers. This is a chuck wagon dinner and show that is definitely worth going to, especially if you have never experienced Jackson before. It is funny and the cowboy music makes you feel like you are really a part of the Wild West. Don’t expect your Jackson vacation to be cheap though. It is a resort area and accommodations and some activities can be pricey. But a lot of what you do in the park is free. And there is no charge for slumming around town. We have friends who beat the cost by camping outside of town instead of staying in hotels. 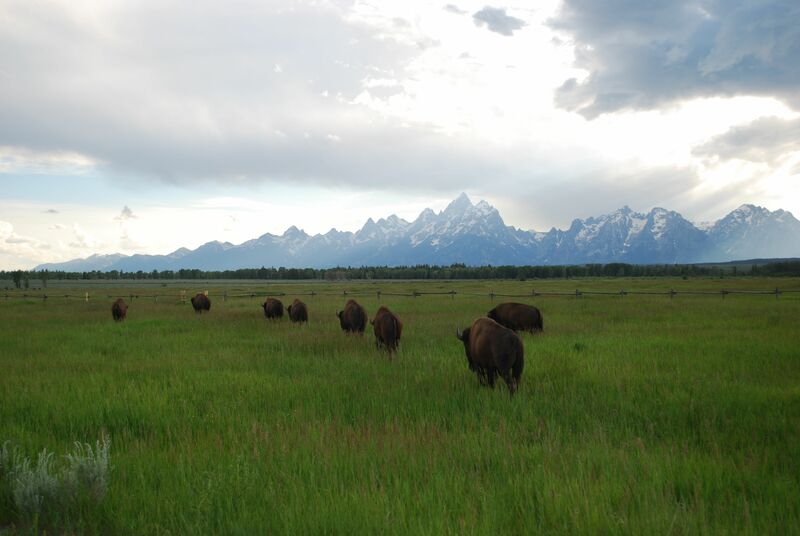 And don’t forget, Grand Teton National Park is considered one of the best spots for observing wildlife. 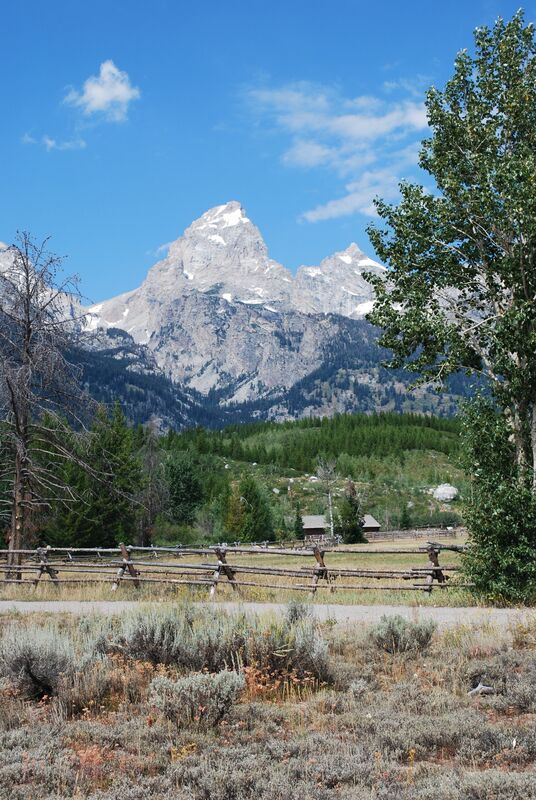 Jackson Hole and Grand Teton National Park: a bit of Western heaven on earth. 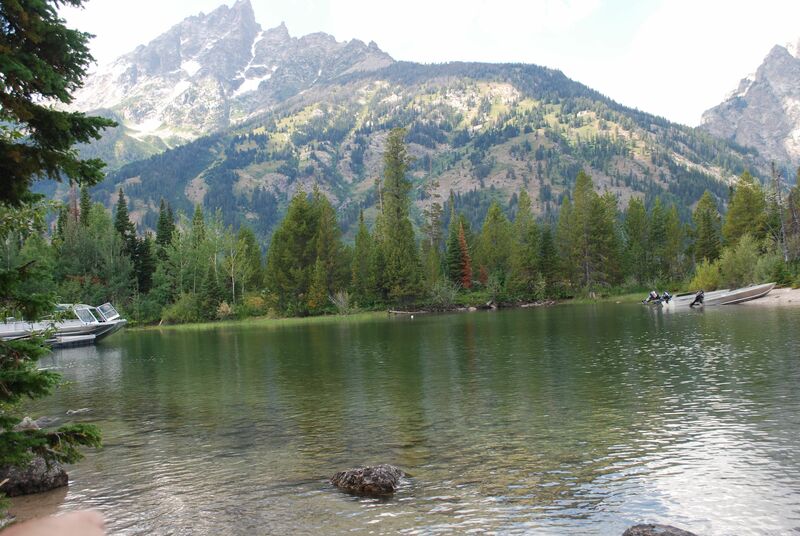 Have you been to Jackson or Grand Teton National Park before? If so, what were your favorite spots? What have I missed? I would love to go to this area. Yes, you are lucky to live so close. Yes, there is a tendency to think that the “grass is greener,” isn’t it? We have so much beauty at home, like you do too! Never traveled in the place you have gone,but after reading through the posts especially the images i can feel your happiness during the traveling.A great post,thank you for sharing! Thanks for stopping by. And by the way, your blog is awesome. What a cool idea! Ahhh…so beautiful! Great photos and travel recount. You guys do so many fun things! This summer when I was in Idaho, Aaron and I left the kids with my mom and went there for 2 nights. WE LOVED IT! I would love to do that bike ride you mentioned. We went white water rafting, which was fun. I also loved that candy store, but for the vintage metal signs on the walls! Such a beautiful place; we want to go back again next year. We have not been rafting, but we have done canoeing out on Jenny Lake. That is so relaxing and fun. I would love to try rafting sometime though.